Georgetown County, the third-oldest city in South Carolina, is located on the Sampit River about an hour-long scenic drive along US Highway 17. South Carolina is one of our favourite destinations and our visits always include a road trip to explore a nearby town. Our home base is usually sunny Myrtle Beach and we never run out of fun things to do and explore. This ocean town is ideal for families as there are endless activities, family friendly accommodations, delicious dining options, a trendy boardwalk with adorable shops, and of course boundless water sports like banana boats, jet skis, and parasailing. 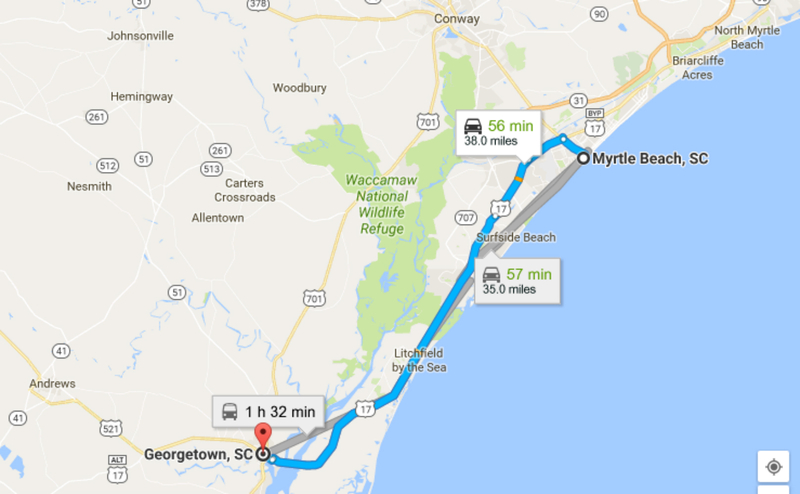 Georgetown is also the halfway point if you are driving from Myrtle Beach to Charleston, and in fact highway 17 will take you all the way there if you want to keep driving. 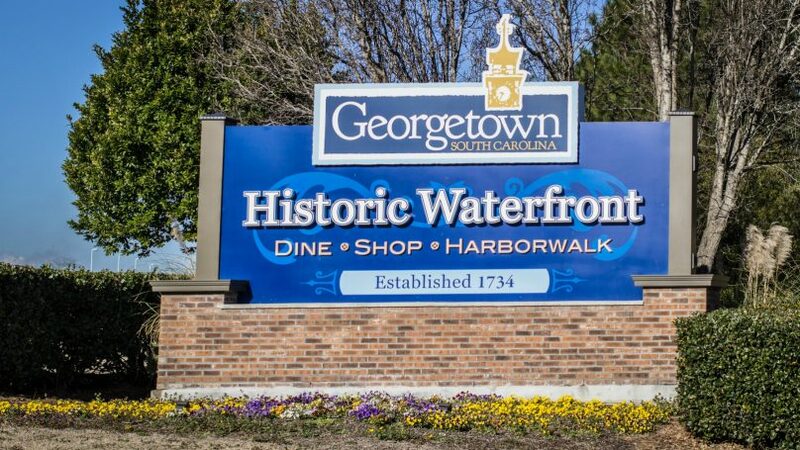 Georgetown is a charming waterfront community with a rich history dating back hundreds of years. It’s a quaint place to enjoy some shopping, dining, and exploring. Our friend picked us up in a shiny FIAT 500 L so we could travel in style. On route we passed a popular state park with campgrounds that in the summer months start to resemble little cities with homey RV’s and pitched tents. Halfway to Georgetown, around Murrell’s Inlet, it started pouring rain and it became obvious why there are so many retention ponds in the area. The lush green trees on either side of the road flourish with the rain and sun and make for a beautiful scenic drive. 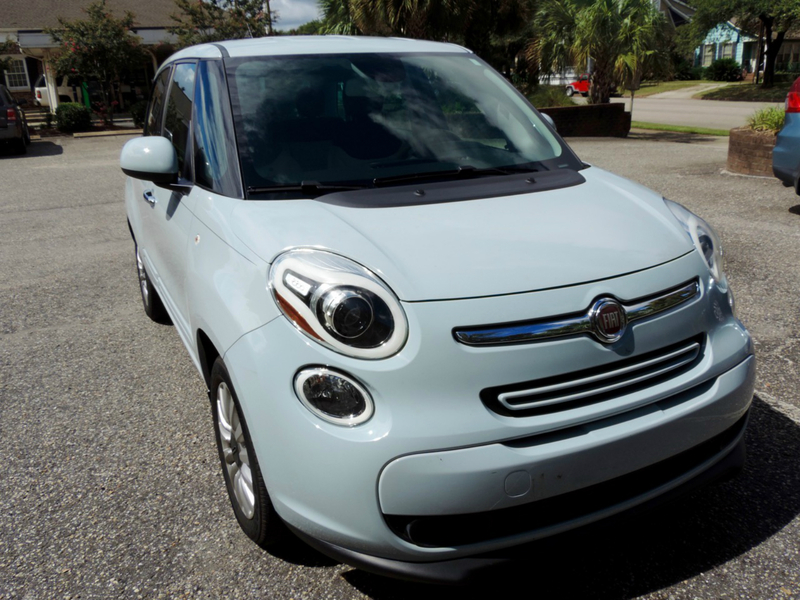 In typical South Carolina style, by the time our cozy FIAT got us to Georgetown the rain had completely stopped. Just south of Georgetown is Hopsewee Plantation and our first stop on this road trip. This National Historic Landmark was built before the American Revolutionary War and dates back to 1740. It was a former rice plantation and the birthplace Thomas Lynch Jr., one of the people that signed the Declaration of Independence. 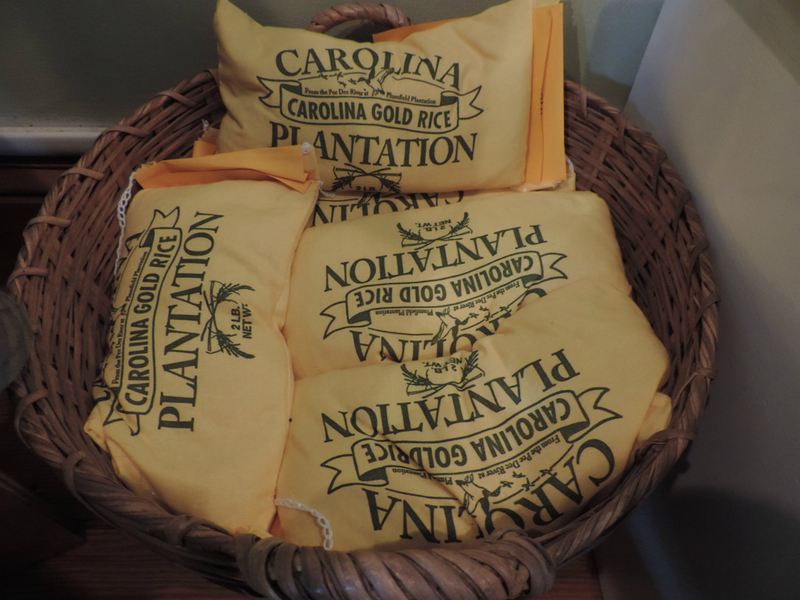 The first crop of rice arrived in coastal South Carolina around 1685 during the Colonial Period, and the area became the largest producer of rice in the United States. 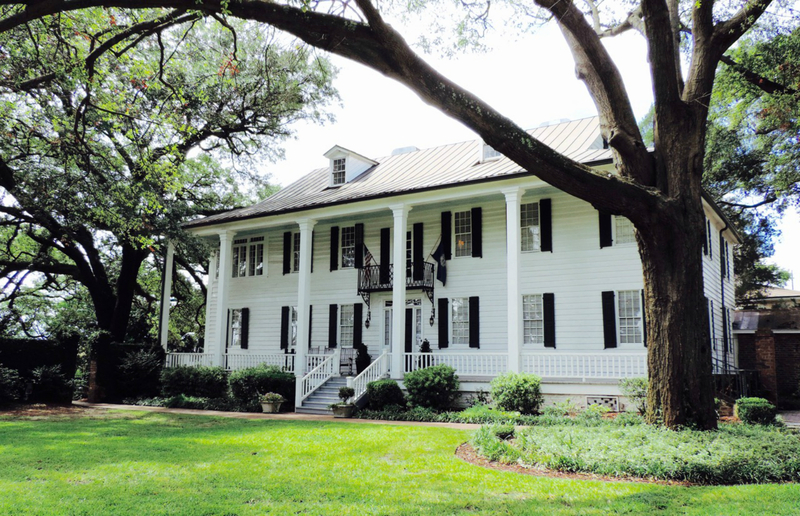 The Hopsewee Plantation is now a private residence with tours open to the public to view the historic house, antique furniture, and the land surrounding the old building. 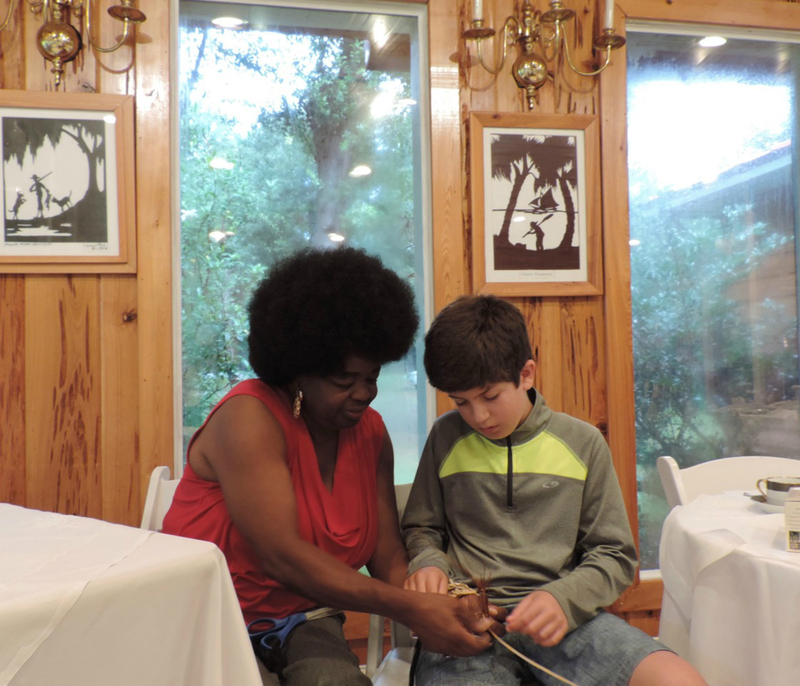 Hopsewee is an ideal place to learn about traditional sweetgrass basket weaving and you can take a hands on workshop with the lovely and talented Ms. Vera Manigault. This South Carolina Lowcountry tradition dates back to the 1700’s when sweetgrass baskets were brought by West African slaves to the United States. Vera tells us that back then all plantations had a basket maker. She smiles and says, “I learned mostly from my great aunt how to make baskets”. She patiently shows Noah how to weave the authentic straw into a masterpiece. Vera must first collect the material to make these baskets, which is proving to be more difficult these days. As South Carolina’s coastal islands are becoming more developed by gated resort communities it’s harder to gain access to the materials as public access is often denied. 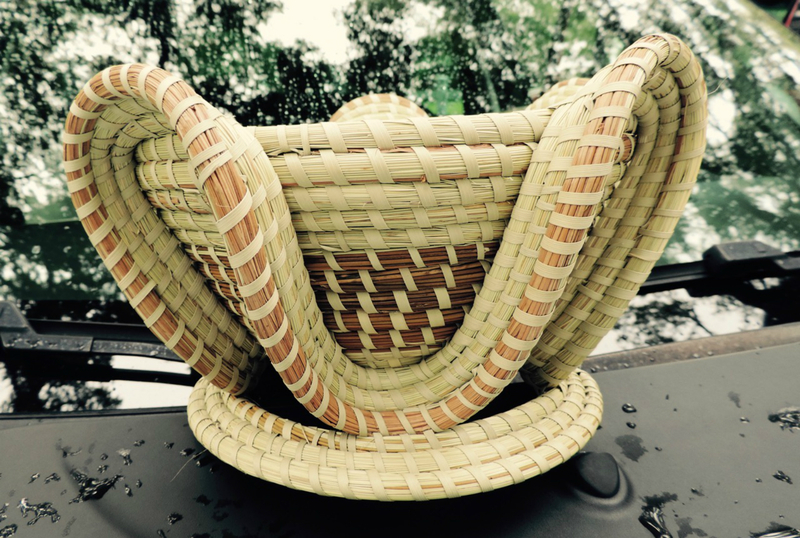 Sweetgrass baskets are made from natural materials such as marsh bulrush, longleaf pine needles and sweetgrass. Vera’s creativity in making her baskets is reflected in the colour she is able to weave into them using natural dyes. The outcome is stunning Colorful Baskets that she sells along the side of the road when she is not busy teaching workshops at Hopsewee. Vera is a ninth generation weaver and Gullah descendant from Mount Pleasant, South Carolina. Back in the car we continue driving through historic Georgetown and our next stop is the Kaminski House Museum. This fancy old colonial home built on a bluff overlooks the Sampit River and is very peaceful. It was originally built in the 1760’s and renovated after World War II. It’s furnished with 18th and 19th century English and American furniture and stunning artwork. Since it was constructed during the reign of King George III of Great Britain it is considered a Georgian design and people from all over travel to Front Street in Georgetown to visit the museum. It has been open to the public since 1973 and teaches visitors from around the world about the history of Georgetown. If you feel the need to balance all this history with a modern flair and some shopping, consider stopping in Pawleys Island on the way back to Myrtle Beach. Of course like many small towns Pawleys Island also has a rich history. In the early 1700’s the families of rice planters that owned plantations settled in Pawleys Island. Today there are still 12 original residences in the historic district. It’s a laid back casual town with beaches, sand dunes, and the famous rope hammocks. Pawleys is great for local shopping at boutiques for one of a kind treasures. When we arrived at the Hammock Shops Village Noah eagerly tested out several unique rope hammocks while I browsed through shops looking at colourful baseball hats, woven carpets, jewelry, sarongs, handbags, funky beachwear, and artisan made artwork. 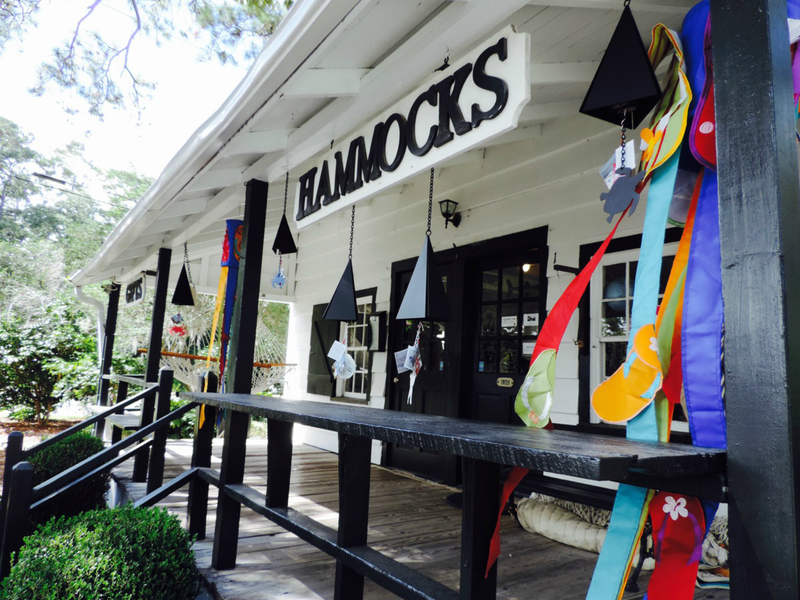 At the Hammock Weavers Pavilion, founded by a brilliant riverboat captain in the 1800’s, visitors can learn the art of authentic hammock weaving and place an order for a one of a kind hammock to bring home and swing on at their leisure. 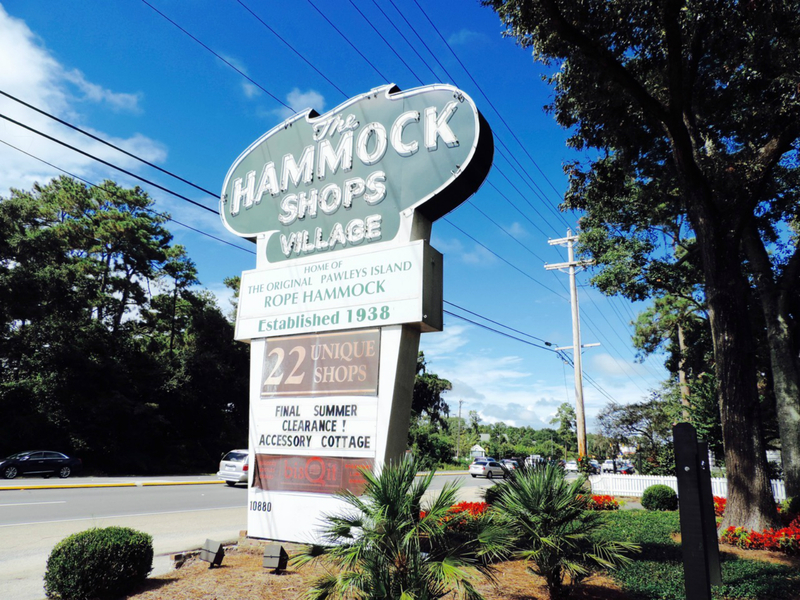 The drive back to Myrtle Beach from the Hammocks Shop Village is just over half an hour. The route takes you past Litchfield by the Sea, Murrell’s Inlet, and Surfside Beach along highway 17, all these towns are great to stop in for a meal and a chat with locals. 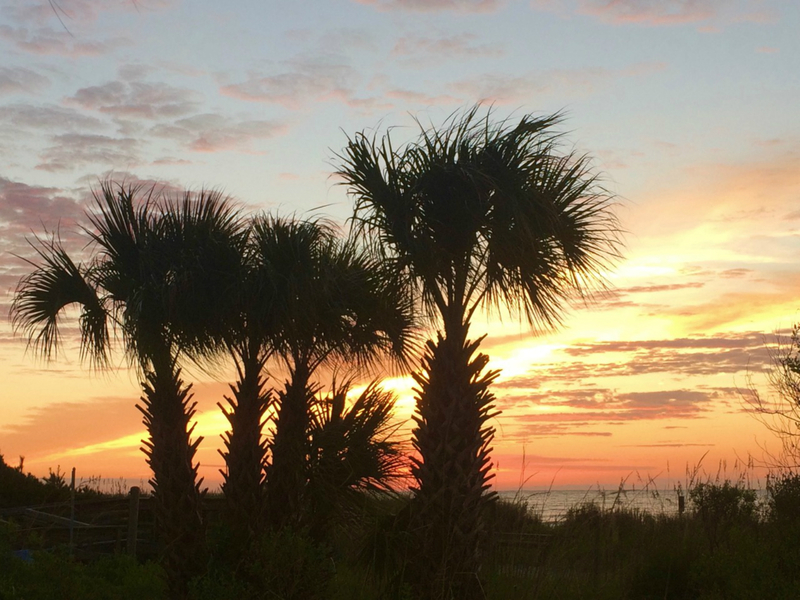 Myrtle Beach is a perfect family destination with an average year round temperature of 25 degrees Celsius and lots of sunny days to explore the 100km of beautiful beaches. 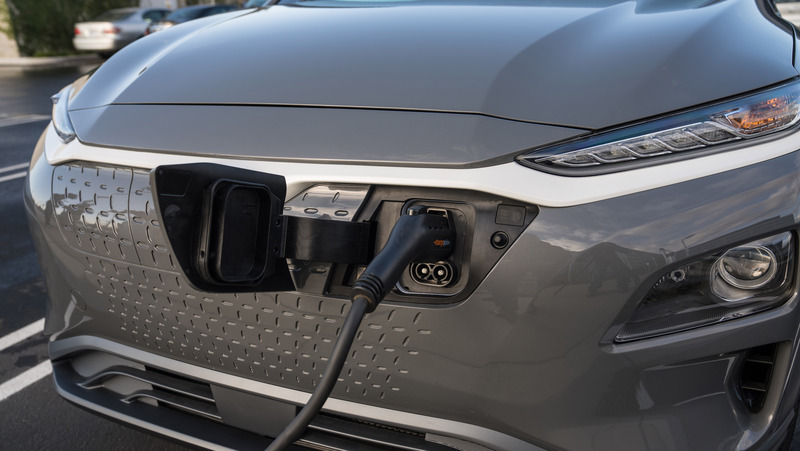 Many Canadians drive from Ontario and it’s approximately a 15-hour drive from Toronto and there are several routes to choose from. Regardless how many times Noah and I travel to Myrtle Beach we are always in awe of the magnificent sunrise. It’s worth getting up at dawn to walk along the shore among the palm trees, collect washed up shells, and watch the orange, pink, yellow, and red sunrise over the waves of the ocean. On our last morning we saw a pod of dolphins happily jumping through the air, as if to wave goodbye to us with their fins until our next trip to the magnificent Grand Strand. For help planning your road trip to Myrtle Beach and surrounding area visit their website.